Oh how adorable Kitty! I love your little Santa with the black & white checked trim, and your little Christmas vignette put a big smile on my face this morning as we head into the Christmas season! The apple crisp would sure be good for breakfast today! Oh this looks so good...I think cranberries enhances so many dishes! Oh my, doesn't this look amazing! I just love the combination of apples and cranberries - yum! I hope you had a most beautiful Thanksgiving. Much love to you! How delightful!Love your tea kettle too!Hugs! Adorable decorations! This sounds delicious but unfortunately I'm allergic to cranberries... but I can change the ingredient out to still enjoy! Thanks for sharing! Have a great week! How sweet you and your daughter swap Santa gifts. This Santa is a beauty! I cannot believe you son painted that beautiful teapot....how amazing! Your Cranberry Apple crisp looks delicious. I can't imagine how wonderful this tastes with the cranberries AND apples!! How wonderful to be able to enjoy these days OUTside. 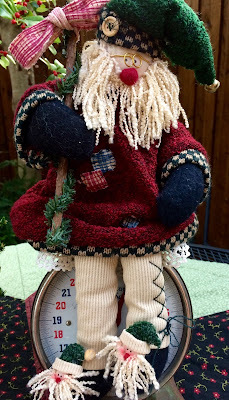 I love the slippers on that Santa -- enjoy those warm, Texas temps. I'm SO envious! Oh, I love cranberries! I can just imagine how delicious this dish is! Whew, that was a tongue-twister! :) Praying for you and sending love your way, sweet friend! I remember your kettle your son painted. He did an excellent job. I'm sure the cranberry crisp is delicious. Your Santa is adorable. I always enjoy seeing your checkerboard tea kettle. The slipper-clad Santa is too cute! Despite the freezing temperatures here, I'm also enjoying ice cream. I recently purchased a rum and eggnog flavoured ice cream. YUM! I still can't get over what a steady hand that Mike had when painting that pot!!! He did an EXCEPTIONAL job!!! I'd still like to know how it is you stay so skinny when you cook up all these wonderful treats?!???!?!!? I just look at them and gain 5 lbs.!!! Hi Kitty, what a wonderful post and I remember the beautiful teapot that your talented son painted. It is fantastic!! Love this delicious treat and your adorable Santa is precious. Thank you for sharing the recipe. What a talented son you have to paint your tea kettle. The cranberry apple crisp sounds like the perfect dessert for this time of year. A crisp is one of my favorite deserts and yours looks wonderful, Kitty. I love the knitted Santa, he looks like he might taste the crisp when no-one is looking. Hi Kitty, this looks and sounds so amazing. I made the corn pudding without the paprika and cayenne pepper and just added salt and pepper. Everyone loved it includig me. Thanks for that recipe as I will be making it again next year. Oh that looks wonderful! Wishing I had a bite now. Oh Boy, does that cranberry apple crisp make my mouth water just looking at it. I will definitely have to try this recipe...thanks for sharing it. 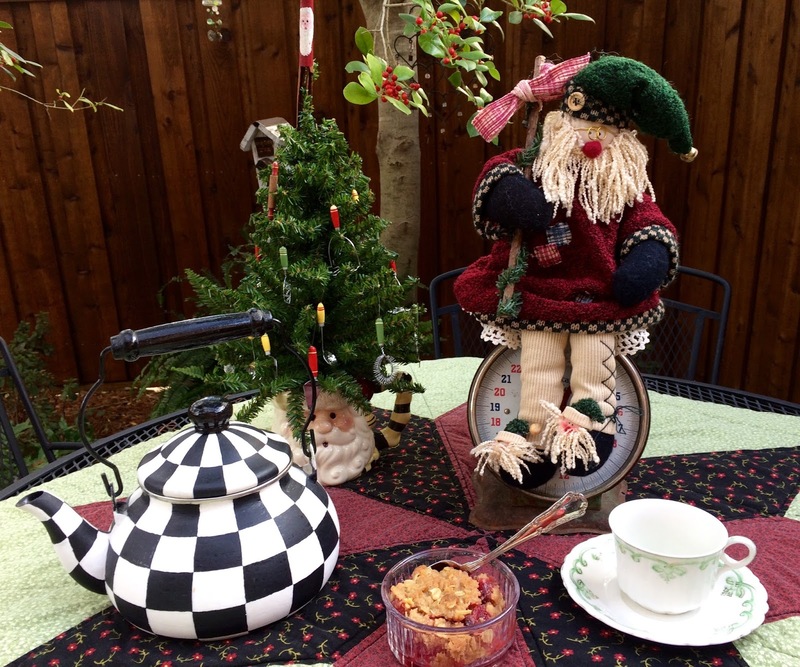 Your slipper clad Santa is just adorable & how observant of you to see how the checks matched the tea kettle. I didn't notice until you mentioned it. Thanks for visiting me at Delights of the Heart. The cranberry crisp sounds so delicious. I love cranberry things. Kitty, I would love this. And I'll have a big spoonful of unsweetened whipped cream on mine! 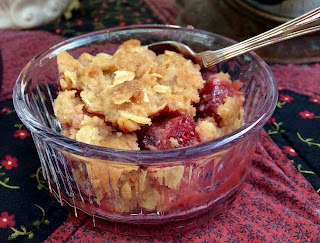 Kitty, I love adding cranberries to apple crisp which is one of my regular go tos for taking to a party. Thanks for sharing. Sylvia D.
Wow - your son is a very creative person and how amazing that he painted the tea kettle! It sure does have the MC look. Your table looks so cute. You have such a great family. Thanks for sharing and linking. Hope you have a wonderful Christmastime. Kitty, you always are baking up some delicious desserts. I love ice cream on any crisp. Your santa is adorable. Your son Mike did an amazing job on painting the tea kettle. He could go into business....LOL Happy holidays dear Kitty. Oh, he did a beautiful job! Everything looks so festive. Wishing for a bowl of that delicious crisp with my evening coffee. Yummy! It was very foggy today and very mild. I'm ready for the cooler temps to return. Thanks for sharing the recipe, Kitty. I will make this! Your Santa is adorable! Do you and your daughter still gift each other Santas? I've been gifted many Santas through the years, as well as adding some myself. This year I've grouped them on a large tray in the sun room and also added some of the small ones here and there in the Irish pine cupboard. It's like visiting old friends when they come out of storage each December. I'd love to see more of your collection. Your son really did a great job with that look alike Tea Kettle. I love the Cranberry Apple combination for your crisp. Hope you are enjoying this wonderful weather that we are having! Hope you are having a wonderful week and thanks so much for sharing with Full Plate Thursday.